While it's probably safe to say that nothing will ever beat the original Reese's Peanut Butter Cup's time-tested marriage of peanut butter and chocolate, that hasn't stopped the iconic candy brand from introducing new flavors and concepts in recent years. 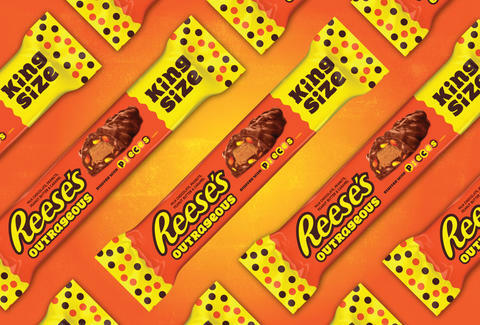 Now, the company is unleashing an all-new creation that could very well come close: Reese’s Outrageous Bars. Reese's officially unveiled the candy bar in a surprise announcement on Sunday, saying the wild new chocolate-peanut butter combo is its "latest and greatest innovation." So what makes it so damn outrageous? 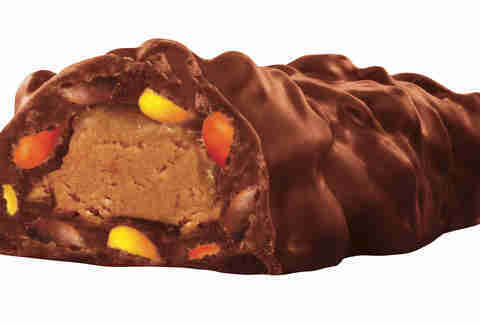 Well, for one, it's nothing like your typical Reese's cup: Each bar is made with a creamy peanut butter center that's surrounded by layers of Reese's Pieces and caramel, then covered in milk chocolate. Basically, it's a wild combination of flavors and textures. Reese's said the Outrageous Bars won't start hitting stores until May of 2018, but it gave an exclusive first taste to trick-or-treaters and other revelers by handing out 30,000 samples at the annual Spooktacular festival in Royal Oak, Michigan, according to a press release. Beats the hell out of candy corn. Tony Merevick is Senior News Editor at Thrillist and wonders why they don't have this ready in time for Halloween this year. Send news tips to news@thrillist.com and follow him on Twitter @tonymerevick.